Oscar Ribeiro de Almeida Niemeyer Soares Filho (December 15, 1907 – December 5, 2012) was a Brazilian architect who is thought to be an important name in worldwide modern architecture. He was a pioneer in the idea of using reinforced concrete for buildings. Buildings made by Niemeyer often have a lot of empty space, making odd patterns. The biggest work he made was the plan for the city of Brasília. Politically, Niemeyer was a communist, which sometimes had a bad effect for him: When the military dictatorship of Brazil happened in 1964, Niemeyer was forced into exile in Paris. Fidel Castro once said "Niemeyer and I are the last Communists of this planet." In 1988, Niemeyer won the Pritzker Prize. In 2012, he died of cardiac arrest due to a respiratory tract infection. ↑ 1.0 1.1 1.2 1.3 "Brazil's 102-year-old architect spends 'crap' birthday". Retrieved 2009-12-15. ↑ 2.0 2.1 2.2 "Dies on Rio the Archited Oscar Niemeyer". Retrieved 2012-12-05. ↑ "Oscar Niemeyer, Designer of UN Building, Dies at 104". Bloomberg.com. 5 December 2012. Retrieved 12 December 2013. 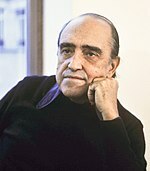 ↑ Pritzker Architecture Prize, "Oscar Niemeyer, 1988 Laureate"; retrieved 2013-3-27. Wikimedia Commons has media related to Oscar Niemeyer. This page was last changed on 2 August 2018, at 21:07.